On Friday, November 30, 2018, at approximately 6:18 AM, Deputies responded to a report of a disturbance at a residence in the 2800 Block of S. Circle Drive. The suspect, Joshua Johnson, DOB: 12/10/89, left the scene in a red Nissan truck as deputies arrived. Deputies attempted to contact the suspect as he was leaving but he fled the area. The investigation on scene revealed that Johnson forced entry in the residence of his ex-girlfriend and threatened her with a gun. The victim also disclosed that the truck Johnson was driving in contained several firearms. A query check of Johnson showed that he was on Parole and wanted on outstanding warrants for his arrest. At approximately 7:07 AM, deputies located the truck parked at an apartment complex on North Nevada Avenue. During a search of the area, deputies located Johnson, but he ran away on foot. A handgun was seen in his waistband as he fled. 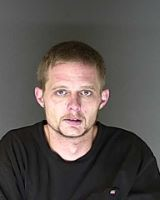 Deputies pursued Johnson, but he disappeared in a drainage tunnel near I-25. The Sheriff’s Office Patrol, Crime Reduction Unit (CRU), K9 and Colorado Springs Police Department Patrol, Tactical Enforcement Unit (TEU), K9 and Drone Operators responded to assist with searching the area. At approximately 9:54 AM, Johnson was taken into custody without incident. Johnson was transported and booked into the Criminal Justice Center Jail for First Degree Burglary, Felony Menacing, Possession of a Weapon by a Previous Offender, Third Degree Assault, Harassment and other outstanding warrants. A current mugshot of Johnson is attached to this media release. The Sheriff’s Office would like to thank the Colorado Springs Police Department for their assistance and continued support.